Author(s): Paula Jorge, Martín Pérez-Pérez, Gael Pérez Rodríguez, Florentino Fdez-Riverola, Maria Olivia Pereira, Anália Lourenço*. Escuela Superior de Ingeniería Informática, Universidade de Vigo, 32004 Ourense, Spain and Centre of Biological Engineering, University of Minho, 4710-057 Braga, Portugal. Background: The combination of antimicrobial products is a promising biomedical strategy against the ever growing number of resistant strains emerging in healthcare and community settings. Agents with alternative modes of action, such as antimicrobial peptides (AMPs), and the efficacy of combined actions are being evaluated. Despite the availability of various antimicrobial data repositories, a wealth of information remains scattered through the scientific literature. Objective: The aim of this work is to provide a global view of available interaction data and help design new antimicrobial studies. Method: We implemented an automated curation pipeline to produce the first ever network reconstruction of AMP-drug combinations. Results: This network relates to antimicrobial combinations experimentally tested against Pseudomonas aeruginosa infections and includes 239 combinations among AMPs and other antimicrobials. Conclusions: Reconstruction is on-going, coping with new experimental results for P. aeruginosa, and will be soon extended to other meaningful microbial pathogens. 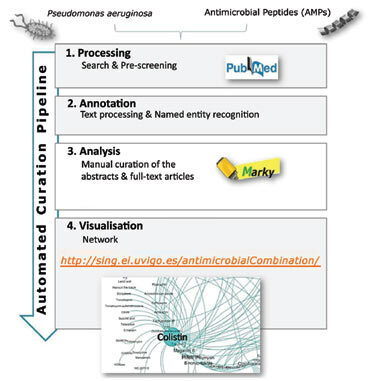 The network is publicly accessible at http://sing.ei.uvigo.es/antimicrobialCombination/. Keywords: Antimicrobial combination, antimicrobial peptide, combination network, infection, Pseudomonas aeruginosa, text mining. Affiliation:Escuela Superior de Ingeniería Informática, Universidade de Vigo, 32004 Ourense, Spain and Centre of Biological Engineering, University of Minho, 4710-057 Braga, Portugal. Keywords:Antimicrobial combination, antimicrobial peptide, combination network, infection, Pseudomonas aeruginosa, text mining. Abstract:Background: The combination of antimicrobial products is a promising biomedical strategy against the ever growing number of resistant strains emerging in healthcare and community settings. Agents with alternative modes of action, such as antimicrobial peptides (AMPs), and the efficacy of combined actions are being evaluated. Despite the availability of various antimicrobial data repositories, a wealth of information remains scattered through the scientific literature.